Life is changing. I guess that’s what it’s meant to do. I’m working more outside the home – and homemaking less. We’ve hired a full-time live-in nanny and we’ve got her doing all kinds of things that I used to do. I now have a much better appreciation for moms who return to work after being at home with the kids for several years. There are lots of chores that I don’t miss (i.e., LAUNDRY, yes I’m shouting it), but some that I do. One of those missed chores is preparing lunch in the morning. And not because I love making lunches – but because of the interactions that come along with that chore. One morning, I happened to have a few hard boiled eggs in the fridge, so I suggested an egg salad sandwich. When it comes to comfort food, it’s hard to beat simple, fresh egg salad spread on fresh bread. It brings back warm memories of childhood – of my mom’s egg salad and my grandma’s, of brunches and Bar Mitzvah luncheons. 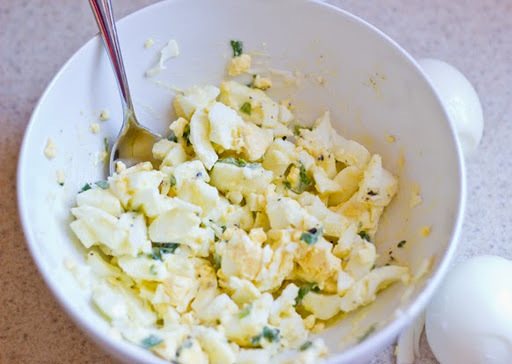 Egg salad, when it’s good, can be amazingly great. The simpler the egg salad the better, to my taste. Roughly chopped egg, mayonnaise, salt and pepper. For a little extra flavour, I add some finely chopped green onion. Some people get all fancy, or chop too finely, or forget something as basic and fundamental as the salt. Everyone has their own taste and my preference is uncomplicated. Before agreeing to taking the egg salad sandwich, Ella wanted a taste. I passed her a forkful and watched her face. “Mmmm” said her broad smile. Is there more, she asked? It may seem like it was a simple egg salad sandwich to you, but it was much more to me. It was an opportunity to share something I love with someone I love and, thus, it became an act of love. Hopefully, it becomes a point of connection that shines long into the future and brings us both happiness. If I know my daughter, I’m sure it will.